Comment: Markings/Highlightings - Book contains highlighting and/or underlining on many pages and shows signs of wear and tear to be expected with a well-used previously owned book. Not the prettiest, but not falling apart either. Cover and/or pages may show other signs of use/wear. We carefully inspected this book. Comes with Super Fast Shipping â€" usually leaves warehouse within 24 hours. Professional packaging with tracking number and 24/7 customer service provided at no additional cost. 100% satisfaction guaranteed with every purchase! A FRONT ROW SEAT AT THE AJAX TRAINING GROUND!! Jorrit Smink, Dutch journalist and himself a soccer coach, had the chance to report on world famous club Ajax Amsterdam for a full season. 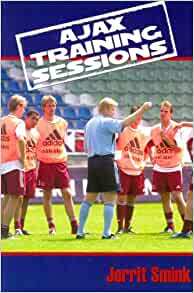 This book is a collection of 40 drills used by coaches at the various levels at Ajax, including head coach of the first team and legendary Dutch superstar, Ronald Koeman. Topics covered include: Warm Up Drills, Conditioning Drills, Shooting Drills, Goalkeeping Drills, Positional Play Drills, and more. Start reading Ajax Training Sessions on your Kindle in under a minute. If you coach youth soccer this book is among the best. There is a reason why the Ajax youth system continues to be the benchmark for youth soccer coaching across the globe. I thought the book would be bigger so I was a bit surprised when I opened the package. The drills explained are very well thought out. Lots of touches in the typical Dutch fashion. Another great tool to have in the hand bag. Ajax Training Sessions gives great drills and insights on what to coach on during the drills. I am satisfied with the the book order process and delivery. I fing it that the book itself (most of the books from Holland) are rather expensive.